Need to Know | Motorists' Rights... Matter! | Motorists' Rights... Matter! Today our Nation’s safety programs are all about each entity’s own self interests to assure its share of pork from Congress, or to nurture revenue and empire building opportunities. The USDOT’s PR group et al in particular oversees these efforts by orchestrating faux data and studies; with forgone conclusions that have virtually nothing whatsoever to do with actual causes or empirical findings. Moreover, the true safety programs are being systematically dismantled, and or are unfunded. According to the FHWA own estimates there are up to 15,000 deaths a year attributed to causes the NHTSA FARS data intentionally excludes, and most reports by the TRB (Transportation Research Board) and NCHRP (National Cooperative Highway Research Program) are wholly based on known unfounded data. The ‘special interest’ have simply highjacked highway safety funding and research that was intended by us "We The People", to be spent on improving the general welfare of the public. Make no mistake about it, by turning a blind eye to these unsafe practices, conditions and oversight responsibilities, the USDOT has now become the greatest threat to motorists’ safety; not speed, drunk drivers, road rage etc. Instead of talking in thousands killed unnecessarily, let’s talk about the 20 plus young people who have died or have been seriously injured nearby here in the last few months alone. What killed and injured them? Long known unsafe public works landscaping practices? We require traffic control devices within the right of way to meet safety standards, but there is no oversight whatsoever over local political whim as to landscaping choices. Read again, there is NO OVERALL ROADWAY SAFETY OVERSIGHT IN OUR SAFETY CODES! Notice in photo 1 the next tree below has impact scars, too. Four fatal accidents involving drivers under 25 here in a little over a year. What did they do? Cleaned up the evidence of the accidents, let the flowers stay for a few weeks, and replaced a couple of the damaged tress with ones that will grow up to kill, again. 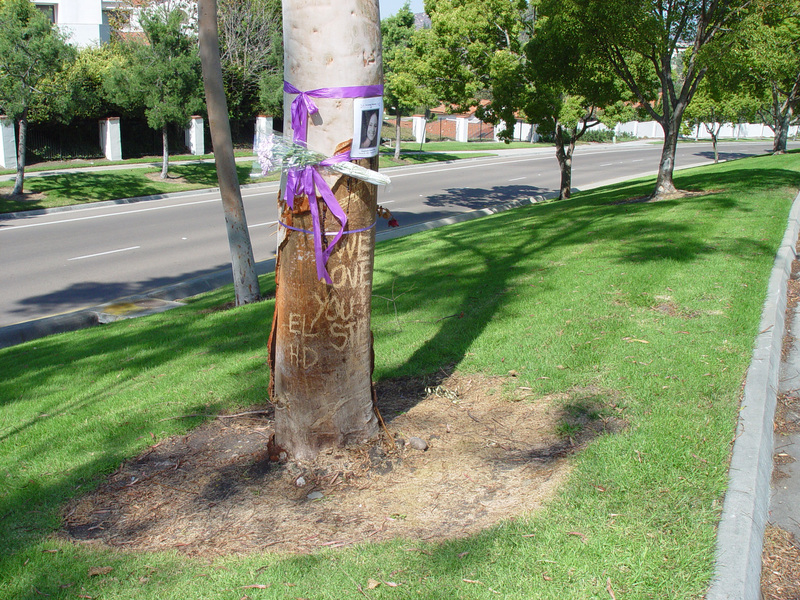 (2007, San Diego, CA, Bernardo Heights Parkway) Or photo 2 here where two young college students died hitting a tree, because of the esthetic treatment the developer chose for this block, whereas, on the prior block (photo 3) they used shrubs that would have saved the lives of these two college sweethearts. (photo 4) Blocks away, another recent example of the tragic cost of a system without oversight. Notice the breakaway sign post 2 feet from the tree that killed this kid. Over 30 years ago Congress mandated the USDOT to mitigate for roadside hazards in its policies. In an act of malfeasance the FHWA clearly stated to us, on multiple related subjects, that they didn’t want the responsibility and refused as a matter of policy to implement Congress’ mandates. Afterwards, the USDOT using administrative rules, subsequently removed anything that could hold them to these mandates; illegally in our opinion. What have we known for 30 years, even before the developer planted these exposed trees, that no tree on an arterial, upon maturity, should exceed 4 inches in diameter without mitigation. Just one of the many causes that ARE NOT listed as a contributing factor in police reports, nor are they part of the USDOT FARS data base, either. We surely can’t have poor oversight be listed as a major cause of fatalities in our safety reports to Congress, or “We the People”, their employer. WASHINGTON (CNN) -- A new study finds roadways -- not driver error or faulty vehicles -- to be a significant factor in crashes that claimed more than 24,000 lives between 1998 and 2001. The Reader’s Digest Magazine and AAA’s numbers are obviously way too low. What the AAA research failed to either notice or report on is the omnipresence legacy of no standards oversight, meaningful roadway access plans, or the fact the USDOT has virtually eliminated our number one safety program; the formally mandated periodic roadway safety audits (engineering studies) on every roadway open to public travel. Despite the laudable efforts of the AAA safety foundation in this report here, even the AAA doesn’t get a pass on blame. On one hand the AAA safety research foundation has clearly shown the benefits of best practices, while at the state level its insurance groups routinely lobby against their own research because of the significant revenue streams these unsafe practices generate. Add to this those being killed according to the USDOT and AAA’s own data by endemic poor practices and oversight and the numbers become almost incredible. Here in its own words is the USDOT estimate on roadway hazards alone. Roadside crashes account for one-third of all U.S. highway fatalities each year. More than 15,000 people are killed and nearly one million people are injured when vehicles run off the road and crash. According to the Transportation Research Board (TRB), many of these casualties result from crashes into roadside objects, such as trees or poles, that are located dangerously close to the side of the road. What is beyond belief is despite all of these groups’ otherwise wonderful sounding names, as with the Roadway Safety Foundation, its Board of directors also include individuals, groups or companies whose acts are in part directly responsible of this human catastrophe. A deadly combination indeed when you add this to the prevailing poor and/or unauthorized engineering and traffic control practices. All this, 40 years after Congress passed the Highway Safety Act, and 18 years after every state began certifying compliance with these safety mandates on all roads open to public travel regardless of jurisdiction type or classification in exchange for federal highway funding. When you state this in plain english it means is for two decades now the FHWA’s inaction and subjugation to special interest has been directly responsible for up to 15,000 deaths and hundreds of thousand more injuries each and every year!!! Why? A significant portion of the why is the politics behind sustaining more than 60,000,000 citations being issued a year for otherwise safe driving, according to FHWA itself! A Sophie’s Choice, the well being of special interest, government agencies. the legacy cost of former employees, infrastructure growth and its funding vs. the lives of the people. We The People have clearly lost! It would be premature to draw any firm conclusions since the research is still underway. However the findings to date suggest that, on average, current speed limits are set too low to be accepted as reasonable by the vast majority of the drivers. Only about 1 in 10 speed zones has better than 50 percent compliance. The posted limits make technical violators out of motorists driving at reasonable and safe speeds. Over a decade later their finding still applies. We have the money to enforce the law (revenue), but no money to do safety audits to make sure the traffic control is set to meet the traffic’s needs or be responsible for safety within the public right of ways. This is no accident either, it is because another agency within the USDOT wants to protect its turf. Here is another of the endless examples of this disconnect. High speed rural highway where the roadway design itself, will kill you if you leave the road. Roadway raised with extreme drop to center of median, with many additional hazards – leave road, die. On western highways in excess of 70 percent of all fatals are single vehicle events. Number one cause of fatals, the roadway design and lack hazard mitigation. Number one contributing causes, fatigue and sleep deficit or an debilitating medical incident. Speed per se as related to the posted speed limit, is virtually never a factor. Public safety for–revenue rather than safety solution, enforce speed limits, close rest areas to save money? The federal and state response, what hazards, we meet minimum requirements! What’s more amazing here, is the few places where there is a barrier between the hazards and the road, there is evidence of many saves. 500 feet with several saves, and five miles with nothing, repeated for hundreds of miles! Moreover, where there is a barrier, it’s always too short on the hazard approaches! The third photo (cross) is an unprotected 15 foot drop just before a rural road underpass that is protected for a 100 feet. Nor would the outcome be any better for the typical unprotected hazard in photo 4, if you should drift 3 feet from the traffic lane here at 70 mph. Tragic video example of our defective roadway design practices. Cause of fatal accident below in video listed as fatigue, the primary cause of the multiple fatalities here are as we assert, barriers designed to meet arbitrary specs that clearly do no reflect the traffic’s safety needs, speeds or the approach to the hazard! Remove vehicle, blame accident on driver. Minor infrastucture damage, roadway design defect ready to kill again, everything is OK! Back to revenue rather than best safety practices by our very own USDOT. The legacy of the NMSL from our last energy crisis created an industry that writes in excess of 60 million citations a year that have no safety foundation whatsoever according to the FHWA, and our politicians are constantly adding new justifications to make traffic stops, and it’s not about safety. We name highways, have state funerals and erect monuments to those that die gathering sustenance for themselves and the related empires, whereas they never erect monuments for the citizens that die or are injured, nor do we collect data on the unnecessary deaths or injuries that result from these revenue efforts. All apparently acceptable collateral causalities for revenue collection and empire building? By whom? A friend’s father died in such traffic stop, just like the one shown here below in the Deadly Traffic Stop video. Why was he stopped? Unbeknownst to him, the trailer he borrowed from his neighbor to move household goods 10 miles had an expired registration; 10 dollar fee. A major part of the problem with all these stops, the approaching drivers are mesmerized by the patrol vehicle’s flashing lights, and because of the moth effect, or the distraction, they steer towards the patrol vehicle hitting the stopped motorists; and move–over laws actually exacerbate the unsafe traffic stop conditions for all, including the officer. In many cases the driver never sees the vehicle that is stopped. Our positions is, if you’re a state worker they go to great lengths to protect you from traffic when you are the shoulder, therefore, if the state puts a motorists in harms way in the same conditions, then they better have a compelling reason. Revenue for an infraction is not one of them! This too could be you, a friend, loved one or your child. The following excerpt from Federal Register in 1995 states it best, NHTSA explicitly refused to accept the FHWA findings that in excess of 90 percent of speed limits DO NOT reflect the safe for conditions speed, or that they need to be reviewed to assure they are properly set as a condition speed enforcement aid. This mindset is pervasive throughout NHTSA’s actions and now reins supreme over all US DOT policies. The problem is this intentional effort has had severe safety ramifications for all traffic control: intersection safety and signal timing, curve and hazard warnings, passing lane exclusion zones etc. NHTSA’s response in the Federal Register to the FHWA and other findings that virtually all limits DO NOT reflect safe for conditions speeds: The agencies have not adopted West Virginia’s suggestion to include a statement that enforcement funding be preceded by engineering evaluations of existing speed limits. To do so would hinder enforcement efforts, based on a blanket presumption that existing speed limits are not reasonable. The agencies are neither willing to accept that presumption nor to place conditions on enforcement efforts, which we view as a vital tool for effective speed control. Here the Institute of Transportation Engineers affirms in safety terms this folly of maintaining under-posted limits: A third rationale is the need for consistency between the speed limit and other traffic control devices. Signal timing and sight distance requirements, for example, are based on the prevailing speed. If these values are based on a speed limit that does not reflect the prevailing speed of traffic, safety may be compromised. In recent response to our concern over the unnecessary carnage, here the text of a FHWA safety official to us about our recent letter in the Las Vegas Review Journal. Citing our claim the the Nevada Department of Transportation was primary cause for the high death rates on the Diamond Highway. "Chad: I can’t find anything I disagree with although I would disagree with one assumption you may have when you make this statement: "local entities who seek to expand their tax base are not constrained by critical roadway safety issues". It’s actually worse than what you say – local entities are ruining their tax base by going along with developers and business trying to save just a few bucks on their initial, fixed costs. Access Management makes more land available for development, encourages clustered land use and ultimately raises property values and sales tax receipts. 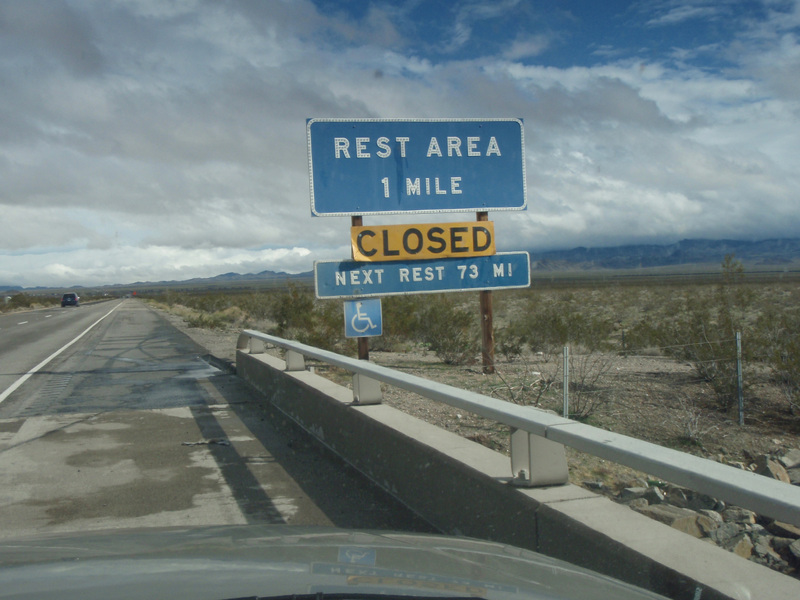 The problem is that individual business can’t control access management on a highway corridor – it must come from strong local, state and federal governance. • Breaking of fundamental governing agreements when a new technology is introduced (i.e. agreement that the functional hierarchy of roadways would be maintained when automotive & highway technologies were introduced in the early 20th Century)." Why is oversight on uniformity critical, is it Safety or Due Process? It’s BOTH! Without uniformity, based in fact, people die and are injured unnecessarily every year en masse, procedural and substantive due process required by our Constitution is denied. Travel within the US is ubiquitous and a right of free citizens. How can we have safety or justice if our actions are governed by local whim and custom, how could anybody of common intelligence discern which local rules apply. For illustrative purpose this data was gleaned from several government websites. In the US, not counting its territories, there are 3143 counties, 44,829 incorporated cities, townships etc. and another 30,000 unincorporated self rule entities; AND hundreds of military bases, 391 National Parks, 177 national Forest, 258 million acres of BLM land, 562 Indian reservations and tens of thousands of other entities open to public travel that employ traffic control devices (shopping centers, private housing developments, golf courses etc.). Added to this, most of these entities also claim home rule, sovereignty or that they can pick and chose what they like in regards to traffic control, and that the MUTCD application/use mandates are nothing more than guidelines that don’t apply to them. Whereas, the current status quo and lack of any meaningful oversight has left motorists in a state of anarchy in expectation, with 18,898 local and state law enforcement agencies and 19,238 state and local courts [plus the Indian reservation police, military, federal and territorial authorities} enforcing�their own local expectations, based on whim, on 4 million plus miles of road. If the agency responsible for championing best practice won’t or can’t do it, or for that matter won’t even try to enforce the few safety standards that remain, who will? This is in part what we have undertaken here, an effort to correct this national tragedy. A recent survey of the states documented how dysfunctional the FHWA’s stewardship of best practices has become. 48 of the 50 states replied with 48 divergent answers applying local practice, with no evidence whatsoever that a uniform national standard is in effect 18 years after each state began certifying compliance on all roads open to public travel regardless of jurisdiction type or classification. None of the states in the survey was in compliance with the Safety Act mandate, some are closer than others, but none comply, neither do tens of thousands of other posting authorities in the US and its territories that are governed by the statutory mandates contained in the MUTCD. This lack of oversight by the FHWA has resulted in a state of anarchy in application and expectation, costing tens of thousands their lives and untold pain and hardship to many many more. Whereas if safety was truly the objective, they could stop this carnage at any time they chose to do so, it is the law, all they have to do is apply it: uniformity in expectation of all traffic control in the Nation grounded in the application of only vetted best practice. This is insane when you really look at what the AAA numbers in the Reader’s Digest article represent, we have lost more people to agency turf battles and to political genuflecting than we did in the Vietnam War, War on Terror and 911 combined. While billions in public funds has been diverted to create urban safety myths vis–a–vis government propaganda agencies that have successfully convinced us that our human sacrifices to these false safety idols was, and still is, in our best interest? Hearing after hearing you see the grieved family member asking for new laws against motorists based on these urban safety myths, but when you examine the facts, the majority were preventable accidents, and the state itself, not the motorist, was the primary culprit/cause of this and many more like recurring tragedies? While the known unsafe condition remains uncorrected? In fact, for more than a decade now the USDOT has been doing after accident evaluations to collect cause data. Conspicuous by its absence, these surveys are wholly about the drivers. Whereas, there no provisions whatsoever or guidance to examine how the roadway design or traffic control may have contributed to the cause. Worse, these poor design elements (killers) are still being built into projects under construction today. Our safety efforts appear to be getting even more schizophrenic. Here is just one example, we spend hundreds of millions in our urban areas installing hazards in the public right of way that kill thousands each year, while we spend tens of millions more in the rural areas removing them? SAFTEA was our latest federal highways funding program. In this act the USDOT further diverted true safety program funding to increase funding for known unsafe and ineffectual programs and earmarked billions more to garner political support from political, agency and special interest constituencies. Why? Because our current representatives are more interested in campaign funding, political favor and money than they are us, the citizens, so they aptly named this act $AFTEA, not Safety!